Last year’s LG G4 was fantastic. It kept the best features of Android alive (like having a removable battery and expandable storage), while ushering in a few new things, like a slight curve to the phone’s body, optional leather cases, and a camera that’s actually worth a damn. Unfortunately, badass specs and cool design didn’t translate to sales. So this year, it appears that LG will be trying something different. 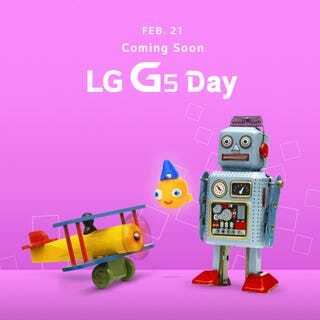 LG is announcing its new flagship smartphone, the LG G5, on February 21 at Mobile World Congress in Barcelona. It’s the same date that LG’s greatest rival, Samsung, is announcing its new flagship smartphone. The theme of LG’s event is “Play” as shown by this animated invitation with a dancing robot and hopping yellow... um... we’re not actually sure what that thing is. 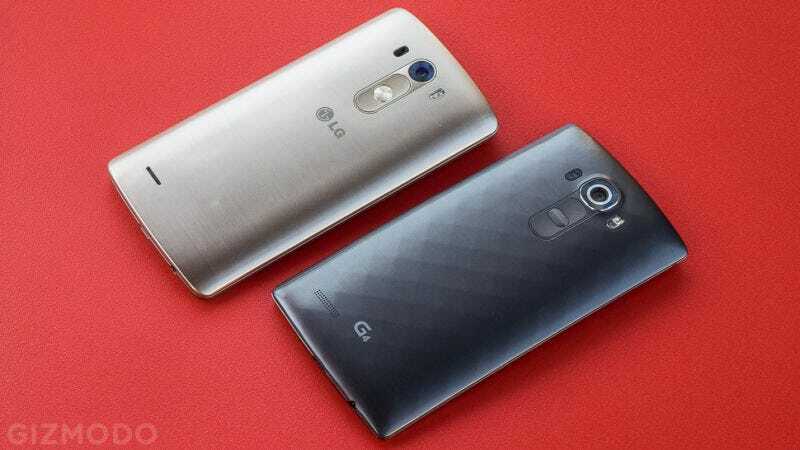 But if the rumors are true, LG will reveal much more than the G5. We’ll get to all of that in minute. For now let’s focus on the smartphone. See the teaser GIF above. LG is expected to make some big design changes to its flagship smartphone this year. Whereas the G4 was plastic and curved, the G5 will be cloaked in metal and straight as an arrow, according to noteworthy leaker Evan Blass. In addition to the Terminator metal body, the G5's main display will also shrink in size, which is rare for every modern smartphone that unflinchingly follows the familiar mobile tenant of bigger is better. Why? Well, probably two reasons, actually. Last fall, LG introduced the V10, a monstrous 5.9-inch smartphone with a second ticker display and a weird dual-lens camera system. The smaller size would help differentiate between the two. The other reason is that the G5 may be adopting that very same second screen as seen on the V10, which will add on a couple tenths of an inch, making the G5 about the same size in the end. Aside from the leak’s solid source, the G series has a tendency to incorporate some of its weirder experiments from other phones. Last year, the G4's curve was brought to you courtesy of the G Flex smartphones, so inheriting some of the V10's more quirky features would have precedent. The big question is do we even really want the feature? On the V10, the biggest problem was that the phone was already big, the second screen made it needlessly so. Hopefully, a smaller G5 can somehow turn a “meh” gimmick into a must-have feature. This image from Android Authority supposedly shows schematics of the upcoming G5. Although this lacks a lot of detail, these images would suggest that LG is getting rid of the curve and possibly stretching the ticker display across the entire phone. LG’s also moved the volume rocker—which last year flanked the power button the back of the phone—to the left side. The camera does seems to have a dual lens set up, which Phone Arena says will actually take two images and stitch them together for a super great (and probably super wide-angled) photos. There are no test shots out there however so we can’t exactly validate those claims until we get our hands on one. However, last year’s G4 camera was absolutely stellar, so if LG improves on the experience, it would be a welcome upgrade. Compared to rumors surrounding the Galaxy S7, LG’s biggest Android competitor, the G5 sounds like it will be somewhat reserved on the hardware side of things. It will have Snapdragon’s most powerful processor, the Snapdragon 820, but it will “only” have 3GB of RAM, an LCD display, and a smaller battery, which is bad news when your phone doesn’t have the more battery-friendly OLED display tech. But with a better processor, the difference will most likely a wash. We expect better battery life than last year’s model. WTF is a “Magic Slot”? VentureBeat also reports that the LG G5 will have something called a “Magic Slot.” The idea is that this slot turns the G5 into a type of modular smartphone with a replaceable pieces that can give it extra abilities. Evan Blass lists several camera modules, including “action, 360, VR, and party,” along with an audio amplifier and physical keyboard. This is supposedly what the Magic Slot looks like. The slot seems to allow the battery to be replaceable, which was one of the G4's biggest advantages. And apparently you can add additional cartridges as well. Honestly, it’s hard to predict what a “magic slot” could make possible, but it’s incredibly exciting to think about the prospect of building a modular phone. Let’s just hope this rumor is true. In recent years, the LG’s user interface has gone from terrible to passable, but by no means better than pure Android, both aesthetically and performance-wise. The software is usually loaded up with bloatware and degrades the Android experience by adding questionably useful stuff like Knock Code, which is pretty useless when you have a fingerprint sensor. Update: the LG G5 will have an “Always On” display and it’ll look like this, as this Android Authority image shows. Hopefully, you’ll be able to read your notifications, much like Motorola’s low-power Moto Display. One additional piece of software might be LG Pay, a mobile payments system that also comes with its own plastic smart card. This feature is rumored to be launching during Mobile World Congress and may come pre-loaded on the G5 like Samsung Pay. The LG G5 will most likely be available on all major carriers—AT&T, T-Mobile, Verizon, and Sprint—like always. As for price, it’ll probably be $600ish, which was the launch price of the G5's previous two ancestors. Although we know the phone will launch on February 21, the actual ship date is still uncertain. Considering LG probably bumped up its smartphone timetable to compete with Samsung at MWC, it’s release will most likely be around the same time. (The S7 is supposed to ship on March 11). The G5 sounds like one weird phone that tries to retain what LG is known for (removable battery) while trying to do something different (metal body, Magic Slot). Of course, the G5 could also be a colossal dud, and a big blow to the company’s already ailing smartphone sales. Either way, 2016 is starting to look pretty bizarre for the world of mobile.